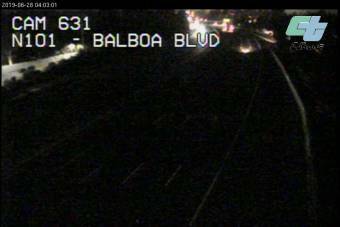 It's 02:05 in Los Angeles, USA right now. US-101 North At Balboa Blvd A view of the current traffic situation. Los Angeles, California: LAX Webcam, 0 miles away. South Pasadena, California: South Pasadena Middle School, 7 miles away. Pasadena, California: CalTech, 8.7 miles away. Pasadena, California: CalTech South, 8.7 miles away. Burbank, California: Bob Hope Airport (BUR), 9.7 miles away. Altadena, California: Altadena WeatherCam, 11.5 miles away. La Crescenta, California: San Gabriel Mountains, 11.9 miles away. La Crescenta-Montrose, California: View over La Crescenta-Montrose, 12 miles away.